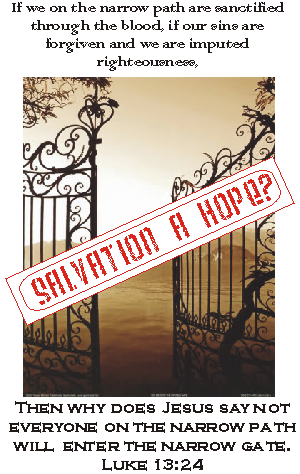 Contrasting the hope of salvation coming at Christ’s return based on scripture with the teachings of salvation at conversion. I recently posted comments from Peter concerning our salvation and how he doesn’t relate salvation to the believer in any way as taught in Christianity. Christianity teaches that, at a minimal, believers are saved at conversion. Others say that they were saved, are being saved and will be saved. Peter says none of this concerning our salvation. Instead in the first chapter of I Peter we find him talking about a coming salvation and how we are receiving not the beginning of our faith but the end of our faith concerning our salvation. In Peter’s eyes, we were born again into a living hope with an inheritance kept for us in heaven. Unfortunately, Robert like so many believers think my position of the timing of salvation, means that I teach forgiveness by the blood of Christ and His imputed righteousness is not instantaneous at conversion. Instead because of this understanding of the church, it is implied that I teach this, although nowhere have I ever taught this. Simply because they can not separate those things from salvation. They have not seen in scripture where there is a group of people who were imputed righteousness by God and most of them still died in their sins.